The Secret Life of Shoes: Cat Fancy! "So Agent Bond, we meet again!" I found the above picture on a search for scary cats. 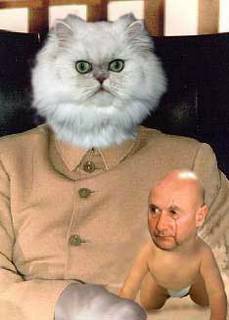 If cats ruled the world that would be what it would be like in the world of James Bond. I have always had a love affair with cats. Since I was a little girl we have had cats around. Not all the time but alot of the time. When I became an adult I decided that cats would be the pet for me. My first one --MiHa--I adopted from a shelter and had her for 15 years. She died in July 1999 and is forever with me. I had her cremated and she is sealed forever in a black ceramic cremation urn in her favorite room of the house----the kitchen--along with her picture. Soon after that I adopted another. It has just taken me till this past year to feel like she was really mine. I have always loved her but the feeling is not the same as for the cat I had before. Funny how love can be different. Her name is Banga. She is a big, black cat with a long bushy tail and bright green eyes. She is the typical witch's familiar! She follows me around the hosue all the time==really like a "dogcat." She has to be where I am at all times. When I was a child I used to have a reoccurring dream that was really wierd. It was all about cats and the end of the world. I remember like it was yesterday. It begins on a sunny, summer day. My family and the entire town is gathered at the local park for a county fair and picnic. We have a wonderful day playing games and eating. The sun is shining brightly. Above us all and located about 1 block away is the water tower. I cannot see the city name but there are letters. It towers bright silver in the sky. It begins to get even hotter. Unnaturally hot. We all get concerned and the mayor calls a meeting. It begins to get so hot that the legs of the water tower begin to loose their integrity...they begin to glow. Eveything begins to melt and we all know that the end of the world is beginning. Evening comes and night begins to fall. There is panic everywhere. It is predicted that on tomorrow the sun will rise and never set again. I go to sleep in my bed and I am alone with just my tabby cat. She whispers to me to come with her. I get on the carpet/throw rug with her and sit. I wait and suddenly there are feathers in my hands and I just know that I am supposed to flap my arms to fly. I do and just as I do I see the low sun bright red on the horizon about to rise. It is my only hope to live..to get away. I flap my arms and my tabby and I fly, fly away. The carpet seems to know the way. I keep flapping and we eventually land in a place were there are only cats. It is a cat world and I am the only human. I am told that If I stay I will have to be a cat as well. I do not know how that will happen but I spend the day close to my tabby and go wherever she goes. Finally at the end of the day I feel myself begin to turn into a cat. I am a cat now living in the cat world with no memory of my former self. I walk away into a sea of other cats and am gone. I wake up and know to this day that the end of the world will begin if I ever get a tabby cat. Needless to say I never have. I just cannot be responsible for armageddon. It begins with me.